Fascinating look at the different the different diffusers teams are trying at Jerez this week. Anyone want to venture a guess on what's on the Mclaren's right rear? They probably did that to distract people from something else they changed on the car, trying to take your attention away from the real trick. It seemed liked it worked on the camera man. 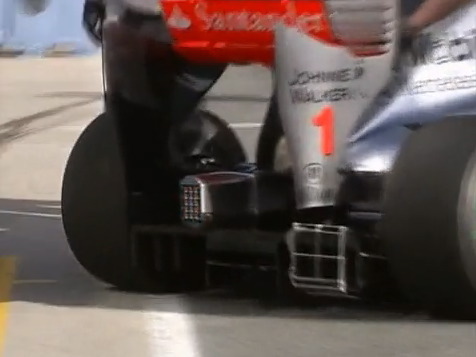 The cage that features on the McLaren rear is to house some sensors to gauge performance of their diffuser I guess? Barichello is the (white) Stig!!! notice Williams is also playing with wheel fairings? James Allen says its a pressure monitor to test airflow since they seem to have a problem with their windtunnel giving accurate results. Thus the green paint last week.